The NMDA Receptor is a specific type of ionotropic glutamate receptor. The name comes from a selective agonist that binds to NMDA receptors but not to the other Glutamate receptors, the agonist’s name is NMDA (N-Methyl-D-Aspartate). The receptor is an ion channel which allows the flow of Na+ and Ca2+ into the cell and K+ out of the cell. The NMDA receptor is an heterotetramer formed by two NR1 subunits and two NR2 subunits. There are eight variants of NR1 subunits produced by alternative splicing of the gene called GRIN1. Each of the subunit has an extracellular N-terminus, intracellular C-terminus and a re-entrant transmembrane domain. Two NR1 subunits which are the essential components of the receptor. 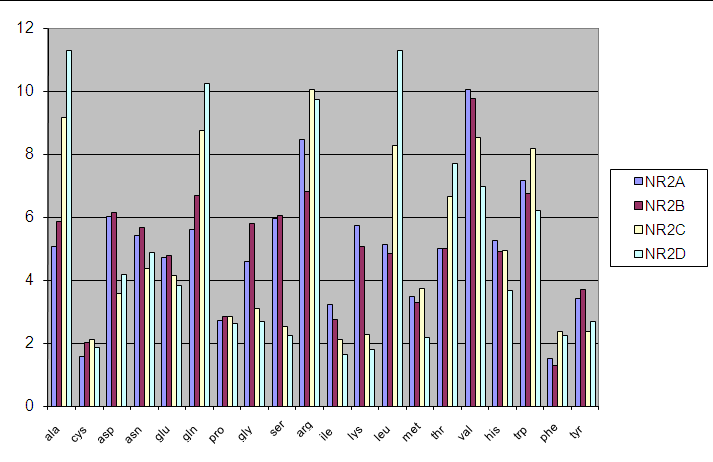 Two NR2 subunits which are regionally localized. The combining of these different subunits allows to create a channel throughout the cellular membrane and to generate a large number of different NMDA recepetors. 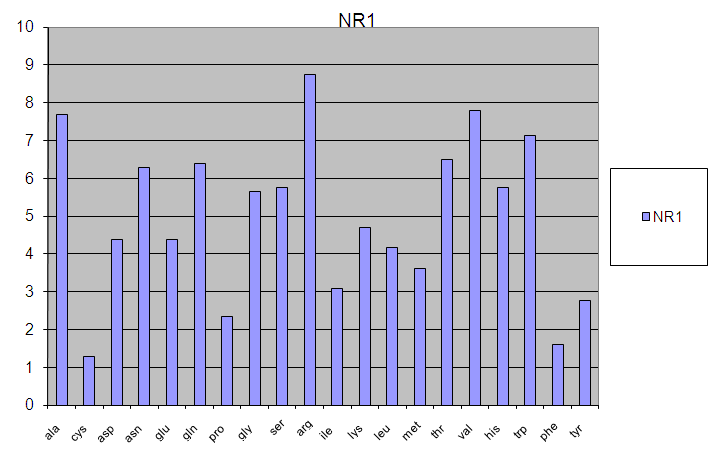 In addition to the variability of the NR2 subunits, the NR1 subunit exists as multiple splice variants, produced by differential splicing of the mRNA derived from the GRIN1 gene. NMDA receptor is a channel which is normally closed at the resting membrane potential; it is both ligand-gated and voltage-dependent. To be opened it must bind to Glutamate on the NR2 subunits and to Glycine on the NR1 subunits; thus the Glycine works as a Glutamate co-agonist in the activation of the receptors. The binding of the two agonists does not open the channel due to the presence of an ion of Mg2+ which still blocks the flow of cations throughtout the channel. Cellular depolarization is needed to remove the Mg2+. The opened channel allows Na+ and Ca2+ to flow into the cell and K+ out of the cell. Intracellular Ca2* is involved in various signaling pathways as a second messenger such as activation of protein kinases and phosporylating enzymes. The NMDA receptor is the predominant molecular device for controlling synaptic plasticity and memory function. NMDA receptor stimulation will also increase the production of spinal phospholipase and induce the production of nitric oxide synthetase. The prostaglandins and nitric oxide, which are subsequently produced and released into the extracellular milieu, can facilitate further release of excitatory amino acids and neuropeptides from primary afferent pain fibres. Mg2+ not only blocks the NMDA channel in a voltage-dependent manner but also potentiates NMDA-induced responses at positive membrane potentials. Content of the neurotoxins cycasin and BMAA in cycad flour prepared by Guam Chamorros. NMDA is an amino acid derivative acting as a specific agonist at the NMDA receptor, and therefore mimics the action of the neurotransmitter glutamate on that receptor. In contrast to glutamate, NMDA binds to and regulates the above receptor only, but not other glutamate receptors.